BSA did not supply complete machines until 1910. Prior to that, frame builders purchased BSA components to build a BSA Fittings Machine and add their own transfer (decal) or head badge. The BSA was the most successful model of spring-frame, with many supplied in knock-down form and exported around the world, in particular to Australia, where they were used for early Australian motorcycles. This is a different variation of the spring frame: instead of a hinged frame, there’s a spring at the bottom bracket and an American style ‘cushion’ rear fork. It has been fitted with a Brown Brothers Paris Depot headbadge, showing that it was constructed with BSA components. 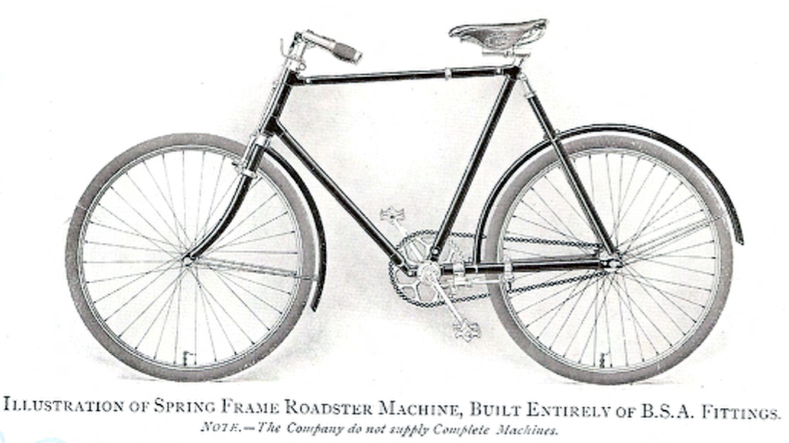 BSA did not supply complete bicycles until 1910. Prior to that, frame builders purchased BSA components to build a ‘BSA Fittings Machine’ and add their own transfer (decal) or head badge. The BSA was the most successful model of spring-frame, supplied in knock-down form and exported around the world, in particular to Australia, where they were used for early motorcycles. The cushion frame was popular in the USA, and many companies offered the option from the late 1890s onwards. I The cushion frame patent was granted on 31 January 1899 to C L Travis and became a popular option in the USA. I assume this BSA Cushion Frame was built to a customer’s order. 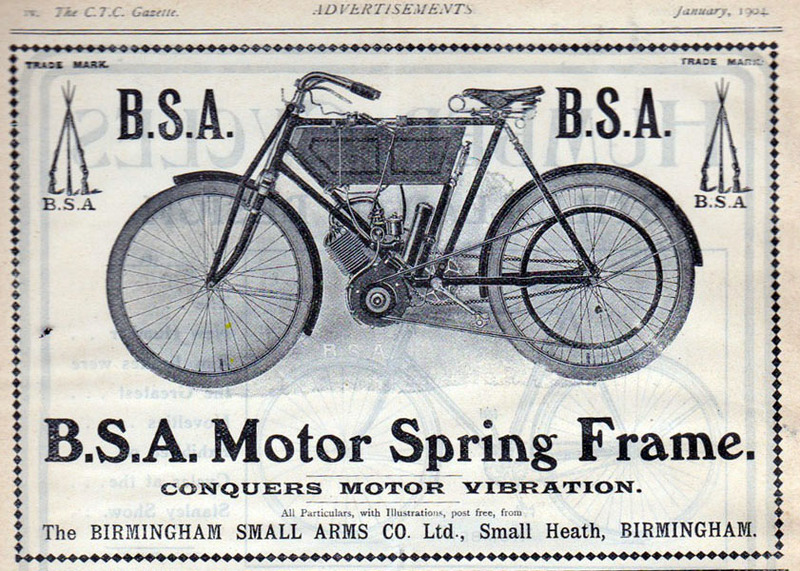 But I’m sure the BSA factory would have experimented with this set-up to see if it was more suitable than the spring frame for adding an engine and creating a new-fangled ‘motor bicycle’. The BSA Fittings Cushion Frame is cosmetically unrestored. The frame is solid, though pitted with rust. It’s in good mechanical condition and the sprung components – rear cushion fork and bottom bracket – function well. The BSA back-pedal brake was only in use for a few years: an innovative option when it was introduced in 1899, braking technology evolved so quickly at this time that it was already out-of-date by 1903. In March 1889, Albert and Ernest Brown rented the company’s first premises at no 7 Great Eastern St and began dealing in cycles, cycle spares and tools. In that same year, Dunlop patented and developed the pneumatic tyre. 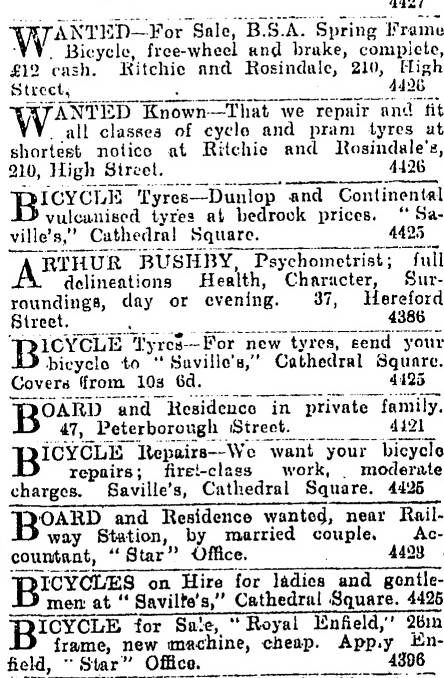 With the arrival of Starley’s Safety Bicycle in 1884 and, by 1990, practical tyres to replace the solid tyres previously used, bicycles suddenly became hugely popular. The 1890s were the cycle trade’s first boom years and Brown Brothers were in an ideal position to capitalize when, in 1893, the Birmingham Small Arms Co decided to diversify from the manufacture of guns, and started producing bicycle hubs. Brown Brothers ordered 2000 hubs and convinced BSA to make bicycle pedals too, ordering 1000 as an incentive. Soon, BSA were making complete sets of bicycle fittings for sale by Brown Brothers. This was an important development. Small engineering workshops and bicycle shops all over the country were starting up, and they needed components. Brown Brothers’ stock of every component necessary for making a bicycle streamlined the supply chain for the retail trade. 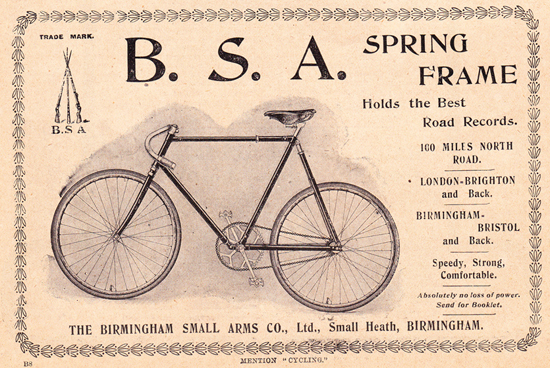 Brown Bros had a sole agency for supply of BSA parts in France, selling both separate parts and complete bicycles in component form.